The Pyle Hearing Assistance Amplifier Aid - Mini In-Ear Impaired Hearing Amplifier with Built-in Rechargeable Battery - Digital Voice & Sound Hearing Amplifier - Universal Fit Ear-Stud - Built-in Rechargeable Lithium Battery - Charges via the Included Charging Base Dock - Interchangeable Ear Tip to Seal Out the Noise - Selectable Listening Modes: Normal, Noisy Background) - Unique Ergonomic Design to Prevent Occlusion Effect - Circular Volume Adjustment Knob - Active Noise Reduction - Over Discharge/Charge Feature - Wider Dynamic Range Compression - What’s in the Box: - Hearing Amplifier - (3) Ear Bud Tips - Charging Base - Technical Specs: - Construction Material: ABS. 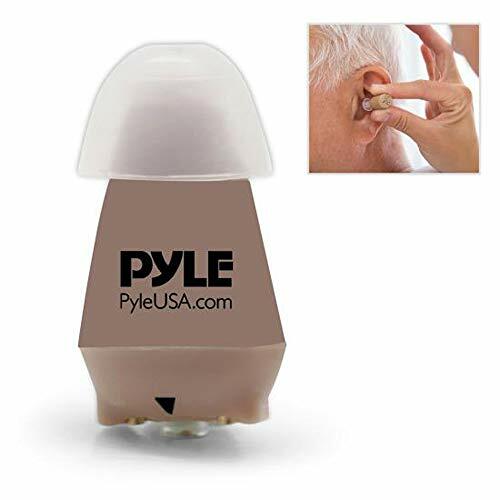 CRYSTAL CLEAR AUDIO: This state-of-the-art mini hearing assistance device by Pyle features a sound output of 125 ± 5 dB so you can hear every little sound without a hassle. Suitable for seniors and all men and women with impaired or hearing loss. MAXIMUM COMFORT: The unique ergonomic design of this mini listening amplifier prevents occlusion effect and perfectly fit your ear that you will even forget that you're wearing it. It is also interchangeable so you can wear it in any.